come live with him in this orangutan sanctuary. grass, go swimming, or just cuddle. Rover, the top dog for the K9 unit for the police in Muncie, Indiana is about to retire. This will leave the local police without the skills unique to a valuable member of their team. But a trained police dog can cost $10,000, and that's a lot of money for the local police in this economy. Ozzy Osborne to the rescue.....wait, WHAT? Yes, the rocker notorious for once biting the head off a bat onstage, apparently loves dogs. He stepped in to purchase a new working dog for the police in Muncie. It was a family effort, brought about with a little encouragement from his son Jack Osborne, who has contacts with the Muncie Police Department after participating in the reality show Armed and Famous. The $10,000 donation will cover the cost of the trained dog, but Muncie PD are working the private fundraising angle to pay for veterinary care, kibble, and other good stuff. Hello my canine companions. It's Riley with another tip for your humans. This tip is called "kennel." My human introduced me to my kennel when I was just a pup looking for a safe haven. She tossed yummy treats in it and said "kennel." Sometimes she gave me stuffed kongs in my kennel and let me explore it for a couple of days before she closed the door behind me. She even fed me and gave me water in my kennel until I began to go in on my own. She would say "kennel" and point to my little home while tossing in a treat. I began to think of it as my very own perfect place in the world and I loved it. Recently I over heard some of my human's friends say that kennels are scary places for dogs but my human, being the great trainer she is, assured them that this was false. "In fact," she would say, "kennels are great for dogs if used properly and not used to punish or serve as an all day enclosure." I listened while she explained that dogs are den animals and feel more safe and secure when allowed to sleep in an enclosed area that they can call their own. I know this is true except for the den part because I like the dining room and kitchen just as much as the den, but whatever. Pass it on. 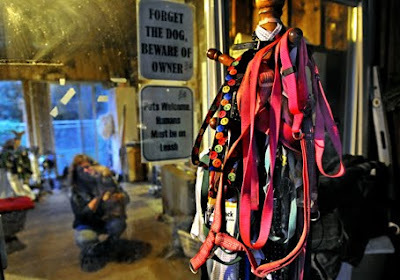 Don't mess with pets, or the guys from Rescue Ink may be knocking on your door. Rescue Ink is an animal rescue group composed of tattooed, tough looking, tough talking guys, some of which grew up in inner city environments where pets were not always treated so great. They also like to say that many of them got a second chance, and animals deserve at least that much. So, they look tough, but these guys have a soft underbellies and a big hearts when it comes to animals. 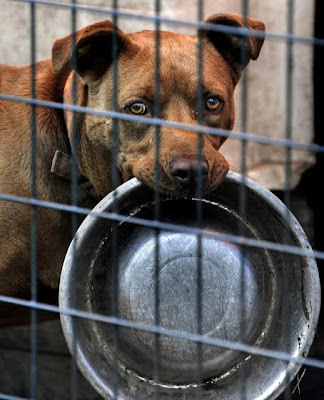 They go into bad, sometimes dangerous, situations and take action on behalf of animals in need. Rescue Ink also works to advocate on behalf of animals, educate communities about animal abuse and neglect, and other activities that prevent abuse and neglect of pets like me. Do you ever wish there was something useful to do with all that dog poop? Well, that idea struck the Tompkins County Dog Owners Group (TC DOG) in Ithaca, New York. These folks are partnering with Cayuga Compost to turn the poop from the dog park into usable compost to sell. Some parks have onsite composting bins, and you can buy a small poop composter for your backyard. If that interests you, check out the Deluxe Doggie Dooley, which also has a helpful guide for do-it-yourself poop composting. But TC DOG is trying to work out an environmentally friendly solution and actually SELL poop! There is no shortage of supply, according to the Associated Press, there are an "estimated 73 million pet dogs in the United States. The average dog produces about 274 pounds of waste a year, which means total dog waste in the U.S. is more than 20 billion pounds." TC DOG estimates they will be able to collect 1,000 pounds of poop a year. Good luck getting the poop, and the business, off the ground! This human mom-to-be, 9 days overdue, was out walking her pup when the dog pooped (it happens). It was right in front of her house, so she was resting on the step for a minute before heading inside to get something to clean it up. Well, that was not good enough for the overzealous police officer who saw the pooping in action--and he ticketed her $250 for not picking up the poop immediately! Poop scooping laws are important for human and dog health and safety, but maybe this officer should have given the woman a break and let her go inside to get a bag. We don't want to take any risks like that, so my person always carry's a roll of poop bags for when I do my business, and has extras on hand in case another dog owner gets stuck empty handed. I know the routine and step aside when she has to do her duty as a dog owner and pick it up. So make sure you do your part to keep the sidewalks clean! I don't want other folks giving us a bad name by leaving a smelly mess behind, but I do think that we can cut some slack for the overdue pregnant woman. still don't spay and neuter their pets. spaying or neutering your dog. Check out this girl Pixie. She landed herself in a shelter, and her chances weren't so good because she is deaf. Lucky for her, Liz Grewal came along. Liz is a specialist in special needs dogs, especially deaf ones, and decided to foster Pixie. Since coming into her new temporary home, nine week old Pixie has learned ten sign language commands! Liz expects that Pixie could eventually have a vocabulary of 100 signals, and will make an exceptional pet. Lots of folks are nervous about adopting a deaf dog, but even hearing dogs don't always listen! Deaf dogs can be trained with little extra work...in fact most dogs already respond to your hand signals, it is just that you also have a word to go along with it. Deaf dogs tend to stick right by you so that they can keep tabs on what you are doing, giving them the nickname "velcro dogs." Deaf dogs can make great pets for families, but Liz says they should be supervised around young kids because young children can make sudden and erratic movements that might startle the dog. Read the whole article for more info on deaf dogs. And remember, "thumbs up" is the hand signal for "good dog"--see how easy this is? I hear that the leader of Libya, Muammar el-Qaddafi (aka Moammar Khadafy), is not so popular with American humans. He is currently visiting New York City, and Maggie apparently got the message. Passing by the dictator's red carpet, Maggie thought it would be a great time to take a not-so-diplomatic-but-highly-symbolic pee! Oops! Libyan officials were less than amused and actually cut out the soiled section of carpet. The American Kennel Club is celebrating their 125th anniversary this year, and to mark their occasion, they have released a list called "the top ten dogs of all time." Interesting stuff, but if it were actually the top dogs of ALL TIME, mutts would have been on the list because we have been following humans around for thousands of years. So, it is actually the top dogs in the history of the AKC. What is interesting about this list is that you can see how popular culture shaped the popularity of particular breeds--Collies were in when Lassie was on TV, Cocker Spaniels were popular after their portrayal in Lady and the Tramp, and St. Bernards were big after the movie Beethoven hit the box office. Also, the dogs owned by past presidents were both reflections of trends, and sometimes trendsetters. Check out the whole list with info on each breed, plus a slideshow here. Hello my canine companions. It's Riley with another tip for your human. It seems that some humans don't know how to approach us if they do not know us. They are not sure how we communicate and so they go about greetings us all wrong. Well don't worry once again I am here to save the day. The very first thing your person should do when approaching a new dog is ask your human "may I pet your dog?" This may seem like an unessasary step but it should not be taken lightly. Usually your person will know if you are the type that has a tendency to get a little nippy or even aggressive and will tell another human in advance. The next step is not to make quick sporadic movements because as you know this can sometimes freak us out and cause us to panic. Tell your human that the best thing to do is be calm and relaxed and pet us underneath our chins instead of on top of our heads. This minor detail may change the act your human is performing from suspicious to soothing and that, of course is what we live for, to be loved. Pass it on. tell them that Scoop sent you! Do you ever feel like you might have taken on too much? It sounds like Dawn is getting to that point. She started out rescuing dogs 19 years ago, with 8-10 in her house at a time. She placed over 2,000 dogs that way. Then the recession hit and shelters were overflowing and neighbors were showing up to her house with puppies. Thats how she ended up with 37 dogs, 14 puppies and 17 cats. That is too much for anyone, but like so many people that work in animal rescue, they don't feel like they can say no because lives are at stake. Dawn health is suffering so she has some tough decisions to make now, but she can't help the dogs if she doesn't take care of herself first. 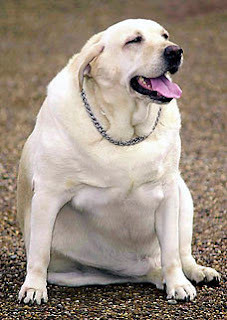 Is your dog overweight? Even if your dog is young and fit now, you should think about how to keep him that way. Like people, dogs have varying exercise needs. But how do you know how much your dog needs to stay healthy? Veterinarian Susan Nelson from Kansas State University has put together a useful guide for determining the exercise needs of your dog, along with some great tips for keeping your pup stimulated, happy, and healthy. Running free on their own is not enough for dogs...they should get out for an uninterrupted walk or run once or twice a day. You shouldn't run long distances with your dog until they are at least 12-15 months because their bones are still growing. Running and walking are not the only activities you can try--fetch and frisbee also provide great stimulation and exercise. Swimming is a good workout for dogs with joint problems. Don't feed your dog right before or after exercise because it puts certain breeds at risk for bloat (AKA twisted stomach). Check out the whole article in Science Daily for a ton more tips. We have another famous TV human is looking out for dogs--Mario Lopez! Mario recently decided that he is ready to bring a dog into his life, but he wants to do it right. He is doing a lot of research on what kind of dog would be right for him, and considering the decision carefully. The great news is that they are going to document the whole process on his show--Extra. This will help raise awareness of the decisions people need to think about when adopting, while also profiling lots of dogs in need of homes. Extra is working with local shelters, the Humane Society, AKC, celebrity pet trainers, and viewers. Wags all around. Check out the announcement, and his website to see all the ways you can participate...sending suggestions, or you can even send in pictures of your dog if you think he looks like Mario! You can also watch the video announcement. Poor Andre got stuck in an animal trap up in Alaska! This guy was so determned to escape from the trap that he chewed of his two trapped paws. But the story has a happy ending! A woman found him on the trail and took him to Alaska Dog & Puppy Rescue, who helped him heal and regain his strength. Andre was still struggling to get around though, so Karen McKnaught of Alaska Dog & Puppy Rescue connected Andre with OrthoPets in Denver. OrthoPets is fitting Andre with some new prosthetic legs! With the help of the woman that found him, Alaska Dog & Puppy Rescue, OrthoPets, and the Denver Humane Society, Andre is a lucky guy to have all these people trying to make his life better. Here is the original article, and People Magazine has an update in this week's issue, but it is not available online. Wags to my buddy Charlie for the tip! Michael Vick recently made his first appearance among schoolchildren with Wayne Parcelle of the Humane Society of the United States. Vick told the kids: "I didn't choose to go the right way, which led to 18 months in prison, which was the toughest time of my life. Being away from my family, being away from my kids who I adore dearly, and being away from the game of football, doing something so foolish, and I wish I could take it all back." That sounds ok, but I am still waiting for him to show a little remorse for what he did to the dogs, rather that what he did to his career. CBS Sports has the whole story on his latest appearance. Among the unconvinced is Main Line Animal Rescue in Philadelphia. MLAR recently placed the ad below in the Washington Post. On October 26th, The Philadelphia Eagles will play the Washington Redskins, and Main Line Animal Rescue will donate a bag of food to a DC animal shelter for every time Vick gets tackled. I am a-ok with that too....it is all part of the game, right? Read my earlier post about his claims of being reformed, and his new commitment to keeping todays youth out of the dogfighting business. Wags to my buddy Shep for helping me stay on top of this story! Check out the Petside website, that has the whole list and a fun slideshow, including links and details about each park. They also have some helpful hints on dog park etiquette and a video on preventing conflict at the park, which your person should check out before taking you there! Do you have an awesome dog park in your area? Leave it in the comments so other readers can check it out! Stem cell are offering new promise to help dogs in pain. 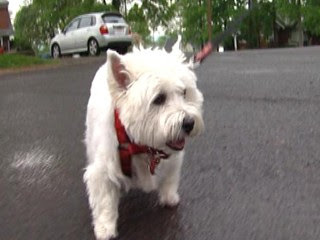 Check out this story of Lola, who had debilitating arthritis, and was barely about to walk. Lola was lucky that her person and vet knew about a new stem cell treatment where they take cells from the dogs fat and transform it into joint tissue. How amazing is that? The procedure costs $2,500, which may sound like a lot, but it is cheaper than a hip replacement, and has a shorter recovery time. This stem cell therapy has an 85% success rate, which is great news for Lola, who is walking and running again without pain. Hello my fellow canine companions. It's Riley with another tip for your human. This week I learned this neat trick called "crawl" and it was so easy to learn. It was so easy that I thought about letting my human know that I was not really working for the treats, but then I came to my senses. What was I thinking! Free treats are one of life's simple pleasures. Anyway, I learned how to "crawl" by doing a slight variation of what I already knew, "down." My human asked me for a down and I enthusiastically cooperated knowing that treats were close. Then while I was in a down position, she asked me to come. Well I hopped up to come but she said no and asked for a down again. I thought my human may need a nap because she is asking me for a come while I am down. Then it hit me, "you can do both!' I started to inch my way toward her treat hand which was low to the ground and close to my nose. Then as I moved forward she said "good boy" and gave me the treat. I just kept on inching my belly across the floor and eating those treats. As I got better she started to say "crawl" instead of "come." That's it! So many treats, so little work. Pass on the news. Do you have a plane? And some free time? Who doesn't? Check out Pilots N Paws awesome campaign this week. From September 12-20, they have the goal of transporting 5000 shelter pets to safety. Pilots N Paws links up pilots with shelters to organize the transport of dogs to shelters that have more room, allowing the flying pups to hang around long enough to find their forever home. Check out my earlier story about PNP and one of their pilot heros, and my original story about the emerging nationwide network creating a virtual underground railroad for dogs. If you and your plane are grounded for the time being, you can also donate to support the cause. Somebody is in trouble! This North Carolina pup was a little concerned when his human got a visit from the police, little did he know she called the police to complain about another dog. While the police were inside, this pup masterfully deflated all four tires on the police car parked in the driveway! That is one determined mutt. His owner was probably less than proud, as she was billed $500 for the damage. It is tough days for swine....pigs are getting a bad rap for being the original carrier of the H1N1 Flu virus. I won't hold it against the pigs, but I still want to know if dogs like me can get it. Turns out it is very unlikely that dogs will catch swine flu, even if their human has it. But we won't get off that easy. 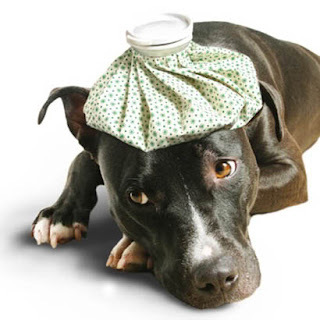 It turns out that dogs are at risk for the H1N8 flu virus! DiscoveryNews has a helpful story about the canine influenza which is most likely to spread in kennels and doggie day car facilities. Dogs got this bug from horses, but there are no cases of humans catching it from dogs (yet). Symptoms include fever, sleepiness, and possible respiratory infection. The good news is that serious complications are rare, but it could be feeling leave a sick pup feeling icky for a few weeks. As always, if you are seriously sick, have your person call the vet! Popular TV human, Rachel Ray, is all about dogs these days. Last year, the TV chef and pit bull lover launched her own pet website and even started selling her own line of dog food. All of the proceeds from her dog food line ($400,000 last year) goes to pet charities. Here is a heads up to pet charities: Rachel Ray is giving away $200,000 to 64 deserving pet rescue charities. The contest, called Mutt Madness, is set up like March Madness brackets, with 64 charities competing for the top slot via internet votes. All 64 selected charities will get some money, but the final winner will receive $50,000 to help pets! MSNBC has the whole scoop. Dogs and babies both depend on people for information. In fact, new research says that dogs depend on people more like a 10 month old baby than our own brother wolves. In a twist on the classic Piaget "A-not-B" experiment, researcher Adam Miklosi determined that dogs will depend on humans for information on where toys are hidden. Dogs and babies seem to be misled by the prior information provided by humans. The interesting this is that wolves are not so easily deceived--they follow their instincts. Miklosi believes that this is because dogs have evolved to look to humans as "teachers" who would not provide the wrong information. Lots of interesting stuff in this story. Read or listen to it on NPR. Big Dogs of the blogosphere have deemed today, 9.9.09, A Day Without Cats on the Internet. You know what they are talking about--the piano playing cat on youtube, the wild popularity of lolcats, and other crazy cat stuff in your inbox. URLesque, the internet culture blog, has organized the effort that has been joined by dozens of other popular bloggers including my favorite dog-tainment website: I Has a Hot Dog. Other participants include Pawnation, Snuzzy, WhyAmILookingAtPicturesofYourCat, PetSugar, even NPR's MonkeySee is on board! These bloggers are abstaining from all cat-related content for just one day to give the dog world a little breathing room. 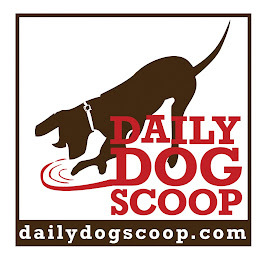 The DailyDogScoop already has a general no-cat policy, but we stand in solidarity with our other pet bloggers today! Ok, this just doesn't seem right. Folks all over the country are grooming their poodles into costumes to catch the eye of pet photographer Ren Netherland, who travels in search of creatively coiffed poodles. It is pretty crazy stuff. You have got the check out the whole slideshow to believe it. MSNBC's Sandy Robins has compiled a list of the top 10 hotel perks for pets. This is a long way from just paying a $20 fee to bring your pup into the Best Western. Now high end hotels are catering to high end dog lovers. Perks include special beds, doggie room service, beef-broth drinks, custom poop-bag dispensers, yappy hours, pet concierge service. One even has a pet spa service that goes beyond simple nail clipping--the Peticure service, where they will clip, polish, and paint you pups nails with a design picked out by you. I'd be happy just sleeping in the hotel bed next to my person without all this fancy stuff. Ok, but beef broth drinks, special treats, and yappy hours do sound like fun. Just don't come anywhere near my toenails!! Check out the whole slideshow of dog oriented amenities at hotels around the country. Hello my fellow caninine companions. It's Riley with another tip for your human. This is a pretty cool trick and It was so easy to learn. The trick is called "touch" and apparently it is a targeting excercise, whatever that means. All I know is whenever I am out on a walk and I hear "touch" I do. Nothing else is more important, not even another dog! So one day my human sat down next to me with a bunch of my favorite morsels in one hand that she put behind her back. She used the palm of her other hand to touch my nose. Everytime she touched her hand to my nose she said "touch" and then gave me some deliciousness from the hand behind her back. She continued to do this for a little while but then she said "touch" and put her palm an inch away from my nose. "That's not cool," I thought, and moved my nose to touch her hand. Well do you know that she said "good boy" and gave me the treat? How cool is my human! Treats for doing almost nothing. She started to move her hand around. First slightly to the right, then left, then up then down but I never lost track and ever time she said "touch" I did. That's it! So many treats, so little work. Pass on the news. Kujo, a 120 pound Presia Canario, had the misfortune of finding himself in an abandoned well during a recent thunderstorm in Maryland. His person was ready to tie himself to a rope to try to go down to save him, but luckily the firemen arrived to help. They got some fresh air down to Kujo while the set up some fancy ropes and pulley to use to get him out. Luckily, it sounded like Kujo cooperated...because Presia Canarios can be big and scary when they want to be! Lucky for Kujo, the brave fireman, Travis Lambert, went down there to get him. The big guy has a scratch on his eye, but is expected to make a full recovery. Be sure to check out my earlier post about another special firefighter that has gotten a few dogs out of difficult situations. Polly is a magnetic dog, in more ways than one. Blue Heelers are known for being high energy and affectionate, but Polly has something peculiar about her--she wants to eat everything! When it come to treats, I eat them all, but Polly really eats EVERYthing! She has eaten rubber gardening gloves, entire rolls of fax paper, a computer mouse, and the occasional gravel. But what got Polly in trouble this time was magnets. Her person stepped out for just a few minutes and she ate over two pounds of magnets! Luckily the vet was able to get them all out (along with a handful of recently consumed gravel) and Polly is on the mend...and under the increasingly watchful eye of her person. Wags to my buddy Shep for the tip! Roo had a rough start on life. She was used as bait in a dogfighting ring and abandoned after she was injured. The good folks at Paws In the City in Dallas, Texas found her with her front legs paralyzed. She has a good foster home right now and they have helped her learn how to walk on her two hind legs. Roo looks like a special pup, with some very special people helping her out! Wags to the good people at HandicappedPets.com for the tip! Have you heard of the folks at "I'm Tired of..."? to raise money to fight animal cruelty. ABC news recently honored some special people and pups in their feature "Person of the Week." They marked the 80th anniversary of the Seeing Eye, the oldest guide dog school around. Over the years, they have placed 14,000 dogs with people needing their help. Only half of the dogs that enter the program get the opportunity to serve because it is such hard work and there are so many commands to learn. These pups need to develop "learned disobedience," which is what they have to do when their person wants to cross the street but a car is coming. That sounds tough! Check out the Person of the Week link for the whole video. Dogs have all kinds of hair--some short, some long, some wiry, some fluffy, some even like human hair. Geneticists have studied the DNA mutations that cause all of these differences. They found that it comes down to just three genes that make all these differences. The interesting science doesn't stop there. Scientists are using this information to understand human cancers--how just a few genes can cause so many different kinds of cancer. Read or listen to the NPR story here. Hello my fellow caninine companions. It's Riley with another tip for your human. Remember when you first came to live with your human at your new forever home? Remember how cool it was to have a new family and how they taught you all these cool tricks like "sit and stay"? Well, when is the last time you actually had to practice? You know the saying goes "if you don't use it, you lose it". My human practices these basic techniques with me everyday. But, we dont designate a time to practice, we practice in our everday lives! Let me give you an example. My human taught me "sit and stay" 35 years ago (dont think humans count like us but you get my drift). Now that I know "sit and stay" like the back of my paw, she asks me to "sit and stay" when she is whipping up some delicious morsels in my bowl or someone knocks on the door. We practice everyday just in more practical ways. I "sit and stay" at traffic lights when we are walking and definitely when my people are eating. This way I never forget. Pass the word. Everyone is talking about the passing of Senator Ted Kennedy these days. He was a pretty amazing man, whose life has been chronicled extensively in the news since his death. One thing that has been missing from the reporting was his love of dogs. Kennedy and one of his dogs, Splash, wrote a book together, "My Senator and me." Check out an audio clip of Kennedy reading the 2006 book here. Kennedy and his dogs Splash, Sunny, and Cappy were often seen together in the Capitol building, and water bowls and tennis balls were a staple on his office floor. Some said that the presence of the dogs helped to cool tempers during difficult negotiations--we sure know how to break the ice! The dogs were even known to dig in the garden outside of the Russell Senate Office Building. Even Kennedy dogs misbehave sometimes! Check out this article from Politico.com about some more ways that Kennedy's dogs lightened the mood on Capitol Hill. The saying goes, "If you want a friend in Washington, get a dog." But it sounds like Teddy had plenty of two legged friends too. I am sure the dogs will be missed up there, but I am sure these guys miss their #1 person too.